No one walks to my son’s school. Why? D’s new Montessori school is up in the hills. No, it’s in the mountains. Like, my ears pop on the drive up. It’s 8 degrees cooler up there. We don’t live on the mountain, so the drive to school feels downright perilous as I get used to it. I sit like a granny leaning in toward the steering wheel gripping it with both hands. It’s all two lane roads. Or sometimes, one and a half lanes. You know, cause there’s a precipice next to ya. There are three ways we’ve taken to get up there (and countless more variations). I categorize them as “Least Scary”, “Scary” and “Holy Hell Don’t Ever Take This Road Again” (that last one was coming from Walmart. My phone/GPS was almost outta battery and I became quite nervous it would quit and I wouldn’t know where to go!) This pic below doesn’t show the AT LEAST 30 turns onto different streets you need to make. The hairpin turns are one thing – they’re the ‘look out your left door window instead of your windshield we’re turning so tightly’ turns – but the steep hills are another. Have you ever given your SUV a ‘running’ start up a steep hill? Or thought that you should avoid this road at all costs if it’s raining? yeah. like that. (not to mention that with parked cars they go down to one lane, or you have the random person WALKING on the road. 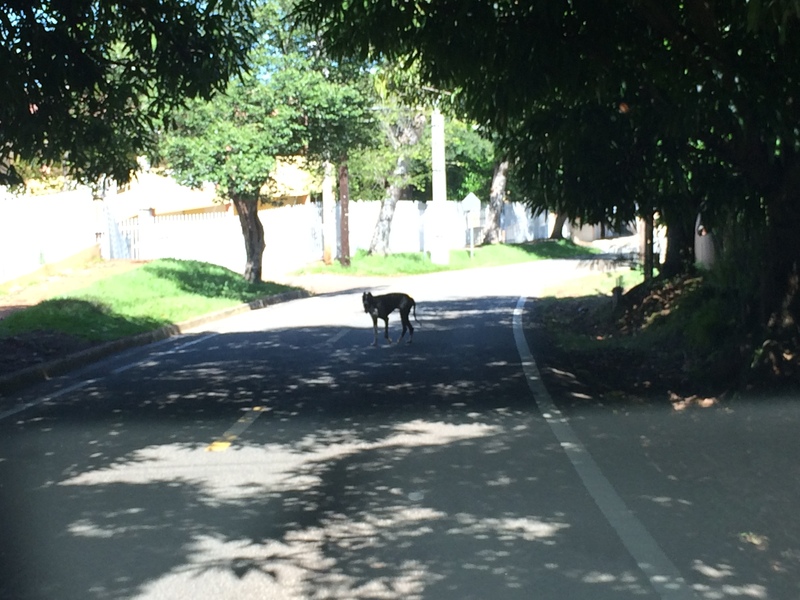 Oh, and stray dogs strolling through. Watch out for them. I don’t need to step on the gas for the first 8 minutes of our drive home! Seriously! There are many homes, a hospital, sports bars etc up in the hills, so most of it is populous. Those people have great views. And I need to remind myself they don’t need to contend with snow, so steep driveways aren’t horrible. On his second day of school, D wanted me to reach out and hold his hand. I was able to for a few minutes. Then I told him I needed to put two hands on the wheel cause I didn’t want to die. No…I didn’t word it like that. But I’ve never concentrated so hard on driving since I was 15 in driver’s ed with Mr. Trepchik. Here’s a crappy video of the last leg of the “scary” route up the hill. The first 50 seconds are nearly continuous ascent. 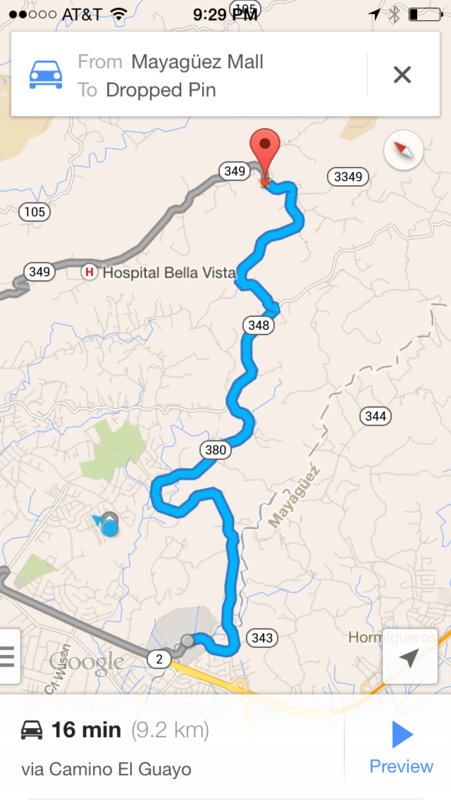 This entry was posted in Uncategorized and tagged curvy roads, driving, montessori, mountain, Puerto Rico, stray dogs. Bookmark the permalink. Ha! I had Virtual Insanity playing on iTunes when I open your video. Appropriate. Wow,what a drive!!! Reminds me of the drive up to my hubby’s cousin’s house in the mountains of Cayey. First question, where the heck did you find this school- Up In the Hills.com, ha ha. 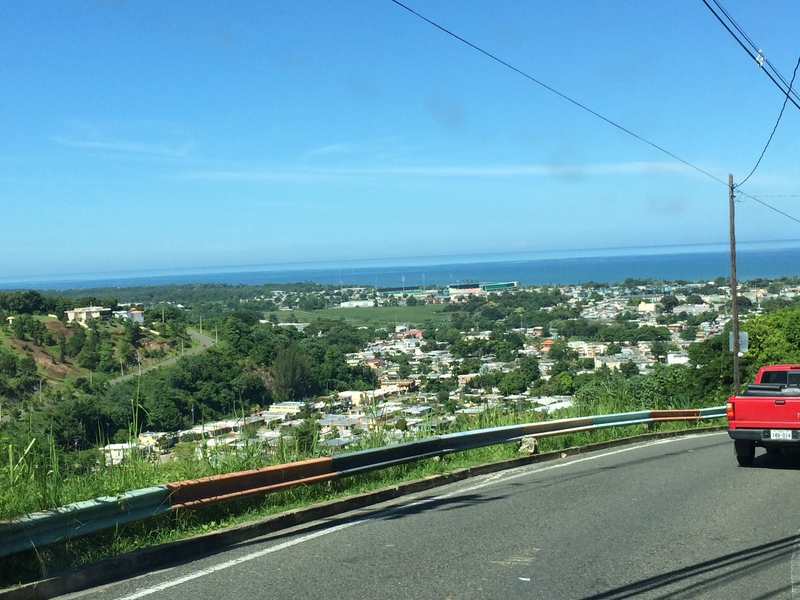 I know that there are many hills in PR and I try to stay on level ground where ever possible. I know that is not always the way it will be. I haven’t began driving here yet and not at all anxious to do that but eventually I will have to and I know that I will do it. Anyway, best of luck with your driving. On another note, I asked my brother in law about a salsa club in San German and Mayaguez. He said that there isn’t really one in San German except a bar or two and he couldn’t remeber the name of the one in Mayaguez. I did look on line and it seems like I had said try the Aguadilla Courtyard Marriott on a Friday or Saturday and also try the Mayaguez Holiday Inn or Mayaguez Hilton. Best of luck and keep Dancing!!! Thanks for the input. I knew we wanted a Montessori school so I did searches for that. Also thanks for the salsa help. Having two little ones I only get out a couple times a month or so, but it’s so fun!